PARRAMATTA’S ‘Gang of Five’ officials should be shown respect and given the chance to defend the allegations made against them, says Eels skipper Tim Mannah. Eels chairman Steve Sharp, chief executive John Boulous, head of football Daniel Anderson, deputy chairman Tom Issa and director Peter Serrao will return to the NSW Supreme Court on Monday as they challenge the legality of the suspensions handed down to them by the NRL. The NRL says the quintet are key figures in the Eels’ alleged salary cap rorting that blew out their player talent spend by $3 million since 2013. Mannah said at Eels training on Sunday the five officials should be afforded the chance to defend themselves. These guys are human as well, they deserve a bit of respect and to be given the benefit of doubt until the findings are handed down,” Mannah said. “It is easy for you or I to point the finger and say what we think is going wrong but unless we have all the details and know exactly what happened there is no real point in us commentating (further). Mannah said players had been addressed by members of the club’s embattled board since NRL CEO Todd Greenberg informed them of the provisional sanctions laid against the Eels on Tuesday over allegations of salary cap indiscretions. Those sanctions include the loss of all 12 competitions points they have earned this season, a $1 million fine and the deregistration of the ‘Gang of Five’. 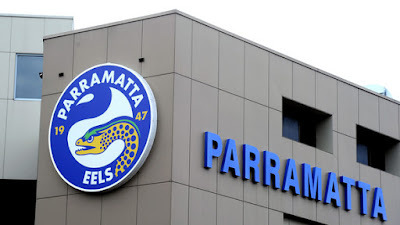 Parramatta have until June 3 to respond to the breach notice they were given on Tuesday. It is expected the NRL will make their final decision on the matter two weeks after that. Mannah said the experience has only served to bring the Eels closer. “It is disappointing and gut wrenching but there is not that much we can do about it, all we can do is focus on playing good footy,” he said. “The boys have reacted really well and the solidarity we have shown through the whole thing has galvanised us and brought us closer together. Parramatta play South Sydney on Friday night in their first match since the NRL’s provisional sanctions were handed down.